A group of suburban Michigan teens spend the last night of summer wandering around town, hitting parties, looking for love — or at least a kiss — and doing what most of us did on those epic high school nights: meandering the humid streets bored, looking for something, anything, to break open the steady monotony of those early high school years before you’re cool enough to drive and get a fake ID. And find somewhere else to be. This wandering around kind of sums up the plot of David Robert Mitchell’s first feature and though it may sound simple, it’s not. The Myth of the American Sleepover is a tiny, sweet movie that feels epic in scale and feels deep without trying to teach you any big lessons about life or love or what it all means. It’s like the quiet wallflower in your Homeroom who turns out to be a Rock God at twenty-two. Maggie (Claire Sloma) hangs around with her nerdy friend Beth, sneaking beers from a cooler at the local public pool, flirting with the lifeguard and longing for something fun to happen before they start high school. Maggie’s the sweet, pixie rebel in the making. She’ll dance in the town parade but she’ll also be the first to smoke a cigarette and kiss a boy. Rob (Marlon Morton) is a horny cutie that tells everyone he slept with some girl during his summer vacation (of course) but who’s never even experienced his first kiss. He sees a hot blonde girl wandering the supermarket aisles and his quest for the night becomes to find that hot blonde girl and… well, he’ll figure the rest out when he actually sees her. Like all the characters, Rob has no grand plan. But he knows what he wants, and for the time being that’s enough. Claudia (Amanda Bauer) is the pretty new girl in town who finds herself going toe-to-toe with the resident Queen Bee mean girl at a not-so-innocent slumber party, and Scott (Brett Jacobsen) finds himself heartbroken and swilling beers back at his parent’s house when his girlfriend dumps him and he drops out of college. Scott is a perfect counterpoint to the rest of the characters; he’s older, newly jaded, lost, and alone. He’s gone out into that crazy, awesome, exciting world they all dream about and he’s come back with a bruised heart and some shattered illusions. He wants what they have. They long to see what he’s seen. All of these desires simmer at the surface as the characters spend the last night of summer swimming, smoking, searching for parties and — yes — having sleepovers. Maggie turns out to be the heart of the film, but that’s not to say the rest of the ensemble isn’t as interesting or endearing to watch. Sloma, like the rest of the cast, had never acted in front of a camera before Mitchell plucked her out of an audition in his home state of Michigan, and she shows a mix of bashfulness and boldness that’s hard to manufacture. When she breaks into a little beer-fueled dance routine at a pool party, it’s hard not to think of Anna Karina shimmying and shuffling around the bar in Godard’s Band of Outsiders. The director sprinkles some subtle – and not so subtle – nods to Godard and Truffaut throughout this film, but they come across as playful instead of pretentious. 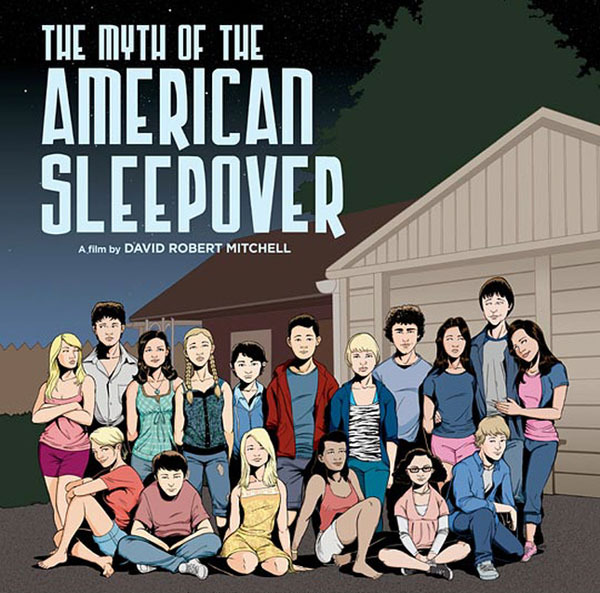 The Myth of the American Sleepover, which screened at Cannes and SXSW in 2010, is a small film that could easily be overlooked by the crowds of people pouring into theaters to see Captain America or (tragically) Zookeeper, but that would be a damn shame. It’s a movie that’s well worth seeing. It’s innocent with an edge, and it’s a movie that’s totally devoid of cynicism at a time when even Pixar flicks toss out little cynical crumbs here and there to the adults in the audience. It’s a movie that makes you want to go swimming at midnight, wonder what lies ahead, and seal the night with a kiss.